They seem to be filming a piece about the "junk shop" on First Avenue near my apartment. Which I'm all for. Good luck. I hope it goes well. Perhaps they could put some identification on this flyer, though? A contact phone number? A company name? They've left these signs up for days, also, not just during the hours when I've seen the camera there. Are they shooting out the window onto the sidewalk? Is the camera hidden? Someone has scrawled "Is this legal?" on it. It would be nice if there was someone to ask. Don't do stupid things that make the public suspicious of documentary filmmakers. Bring out your camera, and if you point it at someone and they say "no" then stop taping them. Have some respect. 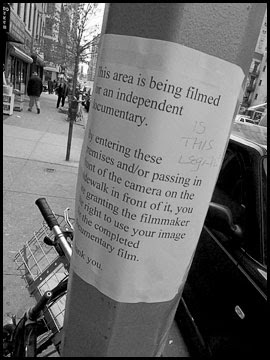 Don't just post flyers that make people think documentarians are out to pull a fast one.